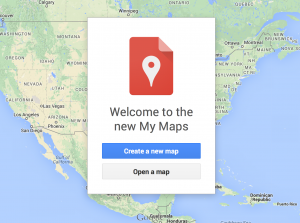 Google Re-launches “My Maps”: Will It Be More Of A Success This Time Around? A few years ago, Google announced the launch of the then ‘My Maps’ (some of you may know it as ‘My Places’). The product was not as widely used as Google’s engineers had hoped – as a result, it was not highly marketed and seemed to fade away into the background as Google introduced a range of newer and more exciting Google products. In 2013 Google introduced a new programme called ‘Google Maps Engine Lite.’ This programme asked users to import their maps into this product, with Google intending to merge the two services together, but this never happened. It was also not supported in the new Google Maps update that was brought into place earlier this year. The new ‘My Maps’, introduced in September 2014, is an updated version of Google Maps Engine Lite. This time around, the two services have been merged together. As well as this, Google has also promised that all old maps will be automatically upgraded towards the end of the year. Users have the option of creating new maps, or those who previously used the service, can update their previously saved maps manually by following a few short and simple steps. The maps still give you the option to save photos and videos associated with each map that you have saved. This makes it easier to remember places you have visited in the past. How will this help businesses? It has become very important for businesses to have an accurate Google Maps listing, as many consumers will use this platform to find you. Having this in place is also beneficial to your SEO strategy and ensures your business stands out from the rest. Danielle Haley is Co-Director for one of the South East’s leading SEO agencies – Freelance SEO Essex. Danielle has worked within the SEO industry for a number of years and has seen the growing importance of businesses using Google Maps. Posted in Social Media News.